Born in 1959 I've been "into" art in for quite some time now. 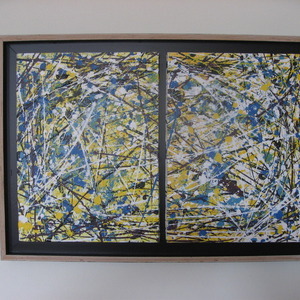 My interests started with a very broad spectrum but narrowed down to abstract work over the years. I very much agree with Willem de Koonings soup theory ; Everything is allready in art - like a big bowl of soup. Everyrthing is in there allready. Just stick your hand in and find something for you" This, my own expressionism, and my interest for a great number of contemporary artists makes me make what I make.